Textures Minecraft - Pocket Edition - this section is specially created for those who are tired of the standard game graphics in your iOS or Android. Selection is very high and there is something is to choose. We update this section of the site on a daily basis as new textures (improvement and optimization or update to the latest version of the game). All published textures pre-tested for their performance and the relevance of them in the game. The textures is actually not bad and they are almost all published on the website, but there are exceptions when the packs are not finalized, then they are avoided. I think that our texture you like. We publish only the best packs for Minecraft - Pocket Edition. If you find some interesting textures-pack on our website, then share it on social networks, to find out about it more players. Sphax Pure 16x is a lightweight version of minecraft PE texture pack with which you can play without lags and fast world loading. Resources are an alternative to the standard, it look much better and more interesting. We present you a great 3D texture pack, which contains a huge amount of updated resources for blocks, mobs, weapons, items and other elements in Minecraft PE. Sphax Pure is a cartoon texture pack with 32x32 extension, which is perfect for phones and tablets with a small amount of RAM ( Less than 1 GB) while maintaining a significant part of the colorful textures. This is a 64x mixture of the VanillaBDCraft, PureBDCraft, Faithful and ZigZag textures. Me and one of my friends "AndreNgheta" made this. Modern HD is one of the most popular realism resource packs from the PC version of Minecraft. Now the texture pack Modern HD is available for the Pocket Edition version of the game! Modern HD is a great choice if you want to make your world more realistic and natural appearance. OzoCraft Texture is a graphical add-on for Minecraft PE in medieval style with a resolution of 32×32! It is important to note that this texture pack is quite dark tones of colors, and many units become a "village". 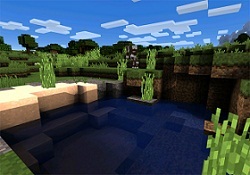 Minecraft PE looks very simple due to the fact that it does not provide shaders. This Shader Pack is able to change existing graphics for the better by adding new fogs, glow, realistic rays, improved shadows and wind. SDGPE Shader is one of the most realistic shaders available for Minecraft: Bedrock Edition. Sphax Pure 128x is one of the best HD texture packs for Minecraft PE. It will update absolutely everything including aquatic world as well as replace most of the standard sounds. Smooth Operator - is over a detailed Minecraft PE resource pack on cartoon theme. To use this on phones, you will need to reduce the render distance by almost a minimum, because the texture resolution is 256x256.